Your smile affects your confidence level. Many adults with moderate orthodontic needs have considered straightening their teeth but have been deterred by the thought of traditional braces. Thanks to advanced dental technology, metal brackets are not always necessary. Located in Gambrills, MD, Dr. Bingham-Lester offers Invisalign clear aligner trays to effectively and efficiently straighten teeth without noticeable braces. Patients considering orthodontics should have a consultation. An examination is necessary to determine your orthodontic needs. Not all patients are qualified candidates for Invisalign. Aligner trays are used to correct mild to moderate orthodontic needs. Advanced technology has replaced metal brackets with clear trays to straighten teeth. Now there is no need to worry about tightening wires or wearing rubber bands. 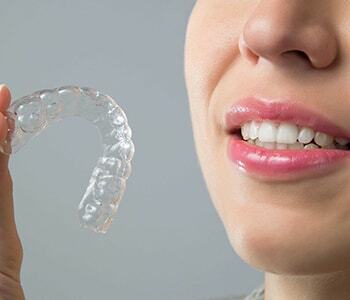 Invisalign uses clear, BPA free aligner trays to gently shift the teeth into proper alignment. Trays are custom created for each patient based on impressions of the teeth. This ensures the trays fit snugly around the teeth for proper straightening. Using a series of trays, each with a different placement of pressure, the teeth gradually move into place. Each set of trays is worn for a couple weeks at a time before being discarded and replaced with a new set. Because Invisalign trays can be removed, patients control their own success. It is important to wear your trays as directed by your dentist. By wearing the trays for the suggested amount of time daily, the chances of a positive outcome improve. It also lessens the possibility of needing future orthodontic work. Treatment time varies from patient to patient due to individual needs. However, when worn as directed, most patients achieve optimal results in approximately 12 months.